Mandingueira’s Holiday Giveaway (Capoeira Beyond Brazil): Win 1 of 5 Free Capoeira Books! Yes, you read that right—happy holidays, everyone! 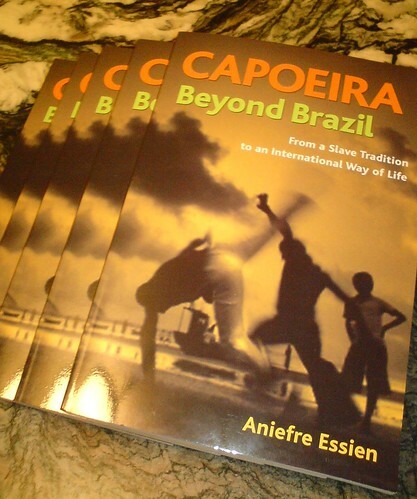 With much thanks to the sponsorship of Blue Snake Books, Mandingueira is offering YOU, my loyal, lovely, and lethally cool readers, a chance to win 1 of 5 free copies of the latest capoeira book on the market: Capoeira Beyond Brazil: From a Slave Tradition to an International Way of Life, by Aniefre Essien. I’ve actually had my eye on this book for a while, since I discovered its planned October release way back in February, so I’m extremely excited about this! I feel like it speaks to an area nearly every capoeirista outside of Brazil would be deeply interested in: the globalization of capoeira. Of course, this is me still judging by the cover, but it won’t be for much longer! In addition to the five copies for you guys, Blue Snake sent me a review copy for myself, so I will be reading and posting a review of Capoeira Beyond Brazil in the upcoming weeks. In the meantime, click here for the book’s official synopsis. This giveaway was originally to be in honour of Mandingueira’s one-year anniversary (it was the second surprise I mentioned! ), but I didn’t want to announce it until I had the books in my hand, and due to a warehouse backlog they arrived only yesterday—just in time for Christmas! Either way though, the purpose of this remains the same: to show my appreciation for all of you, and give something back for everything you’ve added to this blog. Since I am still(!) working on the Mandingueira One-Year Retrospect magazine, these are further tokens of my thanks and appreciation for you, and I hope you will enjoy the books! Now, I’m sure I’ve held you long enough in suspense…let’s get down to the important details. 1. Winners will be picked by random draw. 2. The FIRST way to enter the draw is to post a comment of substance on any post on Mandingueira. This means adding to the discussion, raising new ideas, contributing information, constructive criticism, constructive praise, etc. You can also simply introduce yourself and tell us a bit about your capoeirista/Mandingueira reader/feminist/activist/etc. background, whichever are applicable, if any. (Calling all lurkers, this is for you! 🙂 ) Trite/easy comments such as “Great post!” or “Cool contest!” will be appreciated but not counted, and trolls (NOT to be confused with respectful, reasoned disagreement) will be disqualified. If you post more than one comment (including replies to other people’s comments), I will enter your name once for each comment, up to a maximum of three (3) comments. 3. The SECOND way to enter the draw is to subscribe to Mandingueira, by RSS feed or by email. If you subscribe by email, I will see your email address and be able to count you. If you subscribe by RSS feed, you will have to notify me after you do, through email or dropping a line under this post. (Telling me that you subscribed does not alone count as a comment, unless it is part of a comment that is eligible otherwise.) Obviously, this is honours system-based. Please respect that and refrain from scamming the contest. 4. You may subscribe AND leave comments, for a maximum of 4 entries in the draw (up to 3 comments + 1 subscription). 5. One book will be reserved for an exclusive draw for fans of Mandingueira on Facebook. To be eligible for the exclusive draw, you must be already a fan of the page or join by the end of December 26, 2008 (my time). Note: Those eligible for the exclusive draw may also enter in the general draw, in the ways described above. 6. This contest ends at 11:59pm on January 1, 2009 (my time). 7. At that point I will collect names from all comments and subscriptions from now until then, for both the general draw and exclusive draw. (All comments are recorded in one place on my WordPress Dashboard, which is how I can still keep track if they’re on different posts all over the blog.) Random names will be drawn and the winners notified. There will be two draws overall: one general draw for four books, and the exclusive Facebook page draw for one book. Each winner will receive 1 book, even if your name is drawn more than once. 7. On entering the draw, you must give a legitimate email address so I can contact you if you win, as well as be willing to give me a legitimate mailing address upon winning so that I can send the book to you. I must send out all the prizes by January 7th (because I have a flight that day for a new job in another city), so if a winner does not respond with their address before then, they either forfeit the prize or may not receive it for another 4-8 months. 8. Your entering the contest signifies that you understand and accept the Mandingueira Holiday Giveaway Official Contest Rules. I hope all of that was clear! Please feel free to contact me if you have any questions about the giveaway. Happy Holidays!